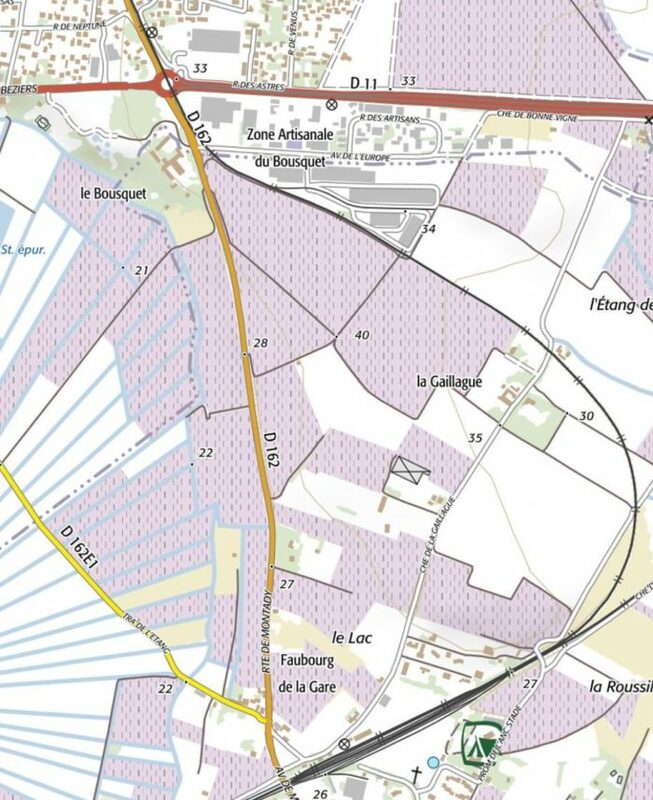 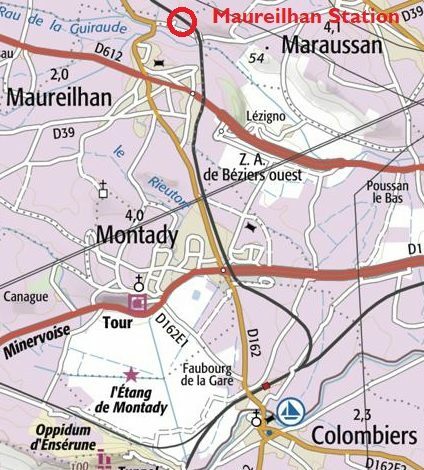 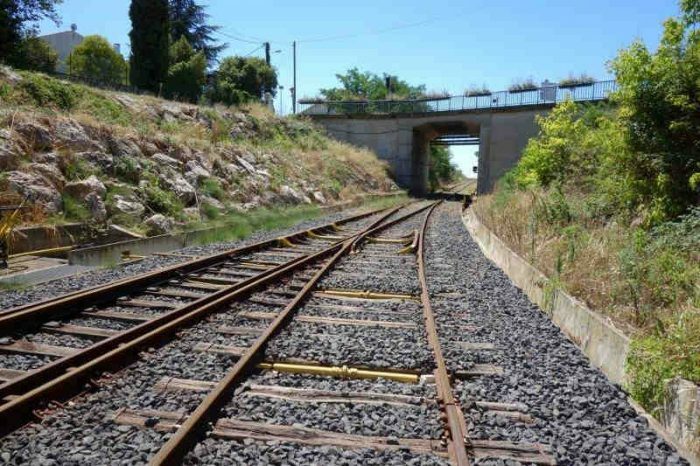 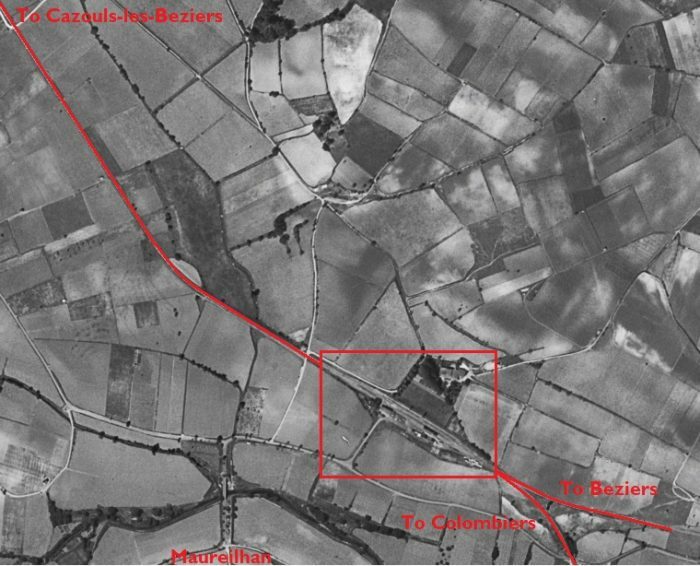 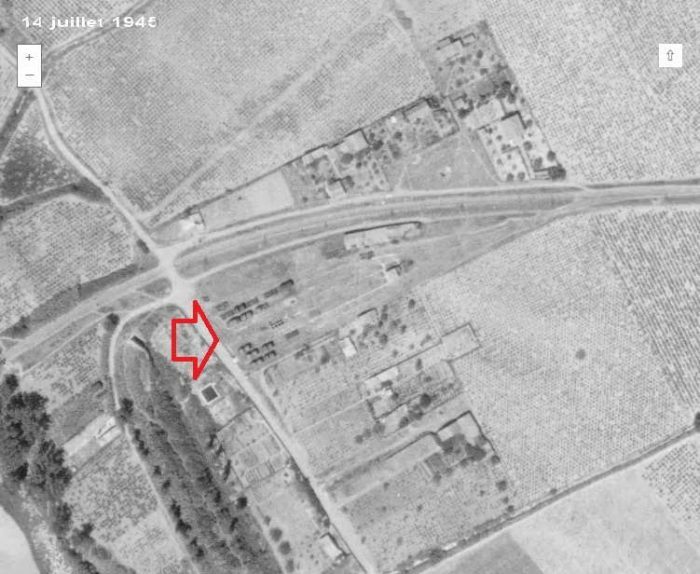 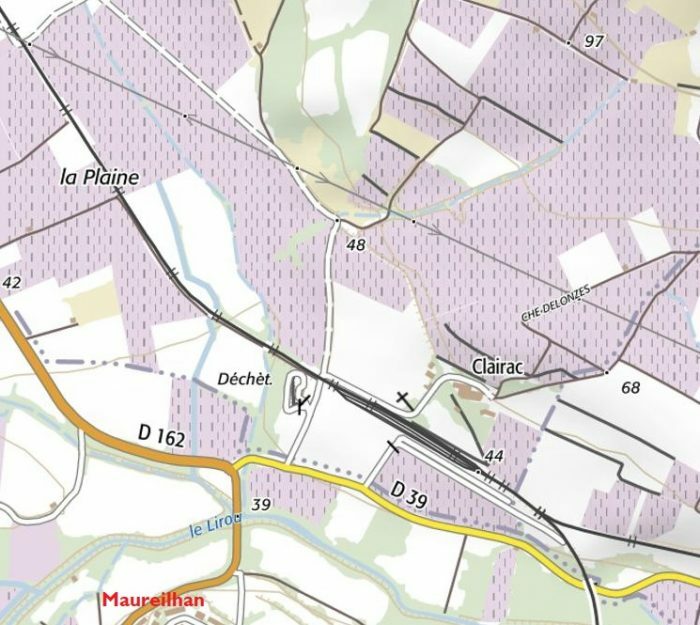 In its session of 14th November 2016, the departmental council of the Herault decided to remove 3.5 km of railway between Maureilhan and Cazouls-les-Beziers. 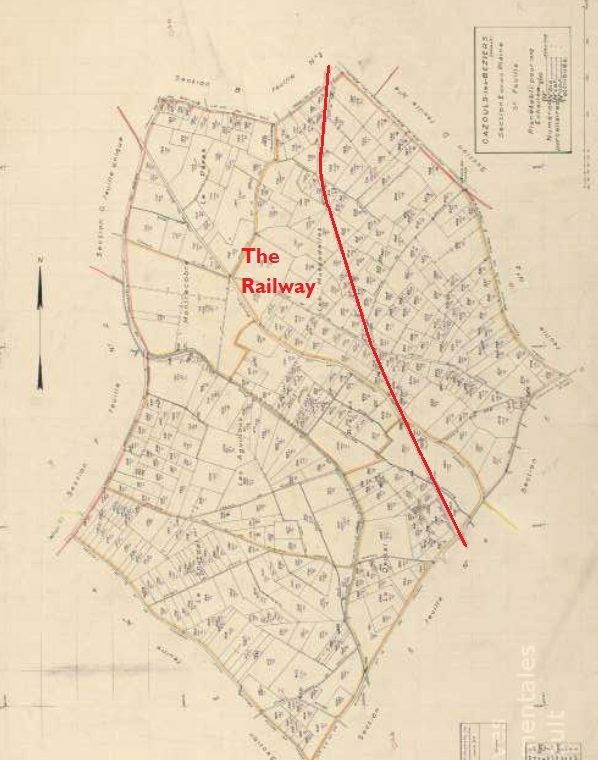 This was the only railway line for which it was responsible and the only remaining length of the old departmental railways, The decision came into effect on 1st January 2017. 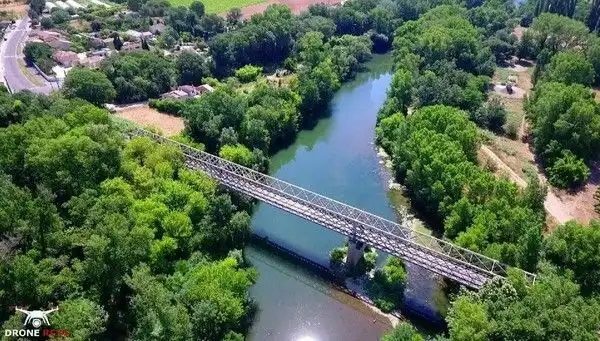 It seems that the only real reason for this was that had the line not been closed it would have had to be handed over to the new ‘Occitanie’ region. 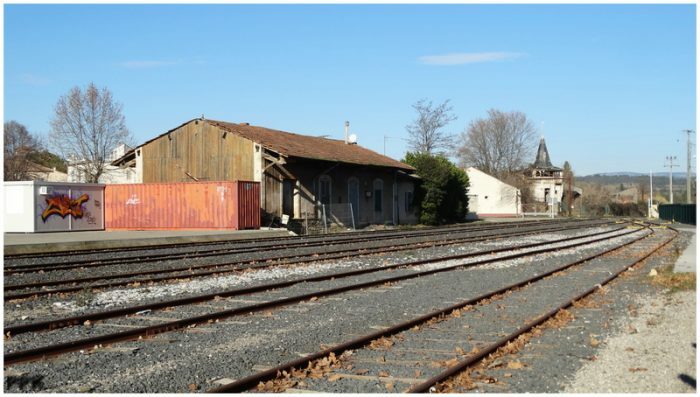 The legal framework included for the transfer to the new regions on 1st January 2017, of all departmental railway infrastructure and operations. 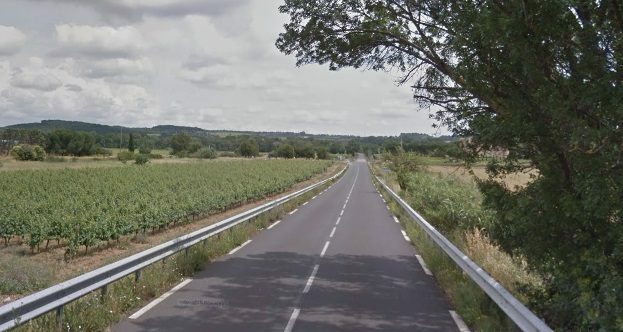 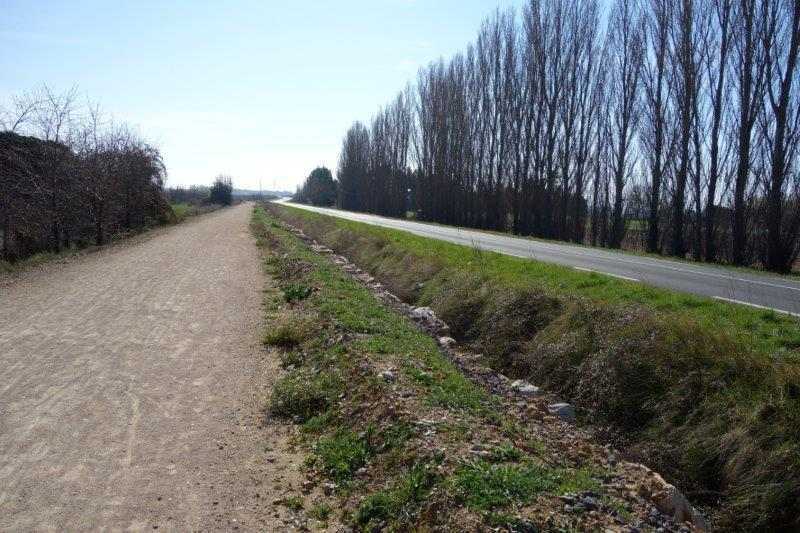 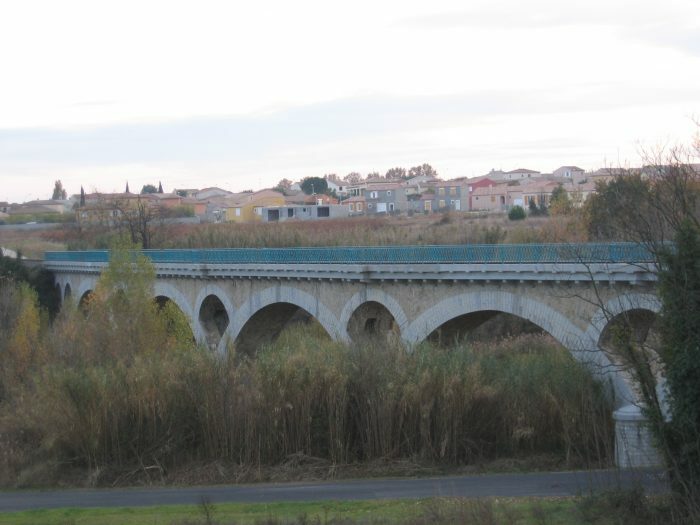 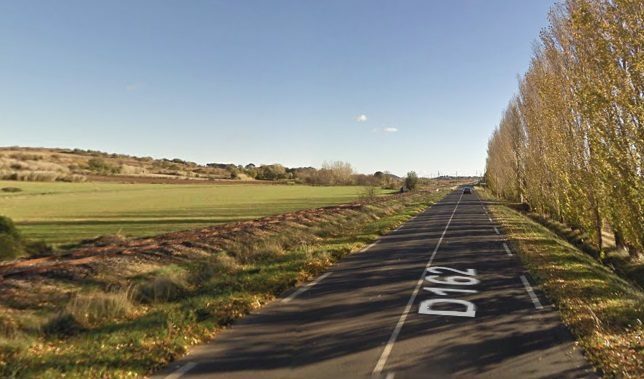 The department of Herault created a greenway between Cazouls-lès-Béziers and Maureilhan as an extension of that planned from Saint-Chinian to Cazouls-les-Beziers. 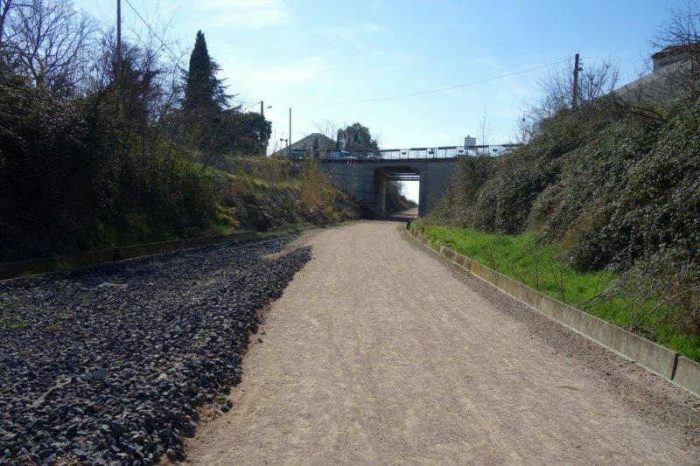 The department set aside 3 million euros for the greenway and ultimately plans to continue that greenway beyond Maureilhan to the Mediterranean coast. 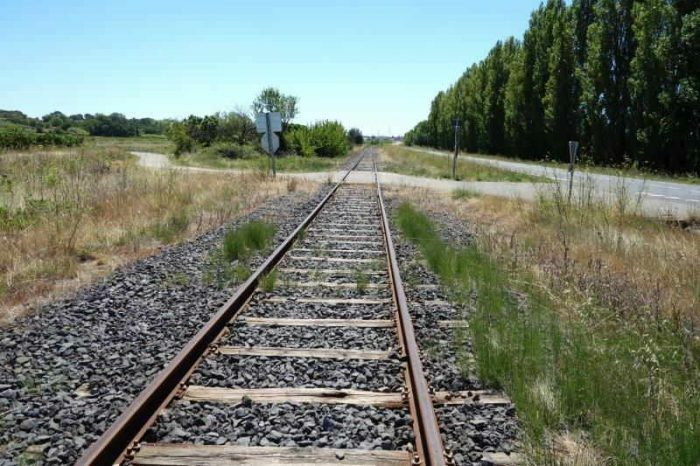 The track was removed during the Summer of 2017 with the intention of commissioning the greenway by the end of 2017. 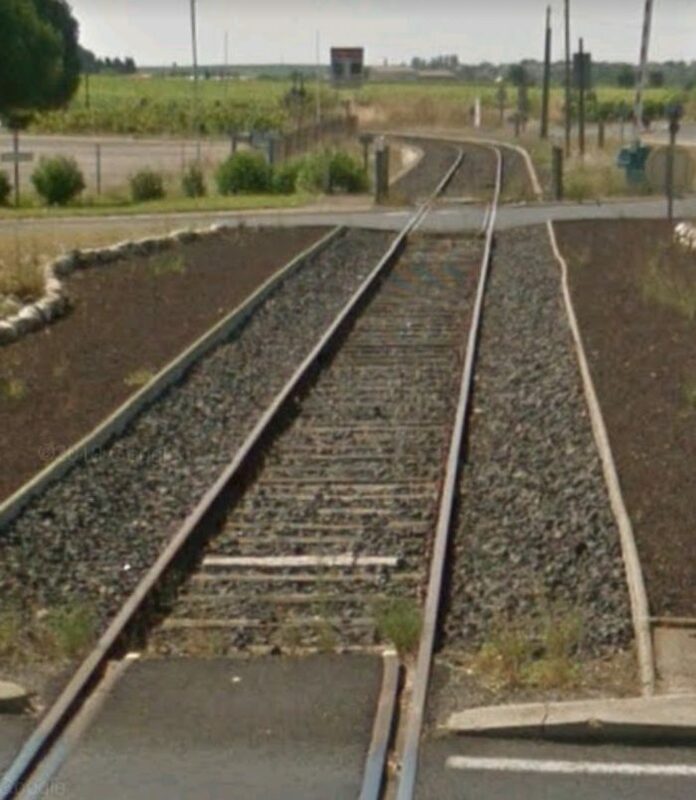 It seems unbelievable that this line had only been refurbished in the period 2007-2009. 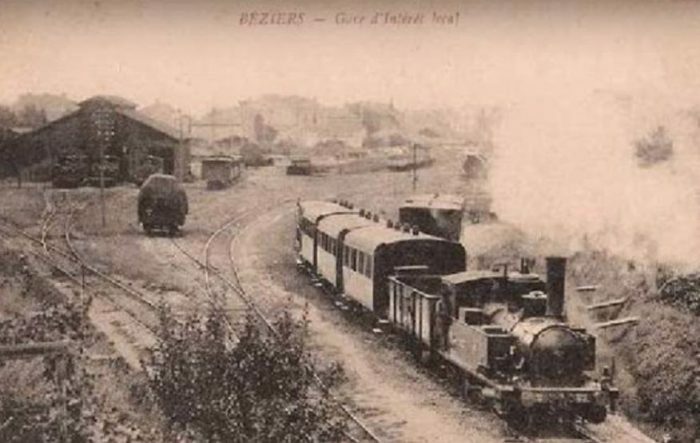 It was provided with two dedicated locomotives with a specific livery and the inscription “Hérault railways”: the BB 1201 ( 83,2 kW / 1,200 hp) and the No. 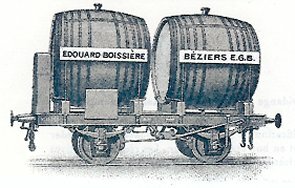 302 diesel engine (220.8 kW / 300 hp). 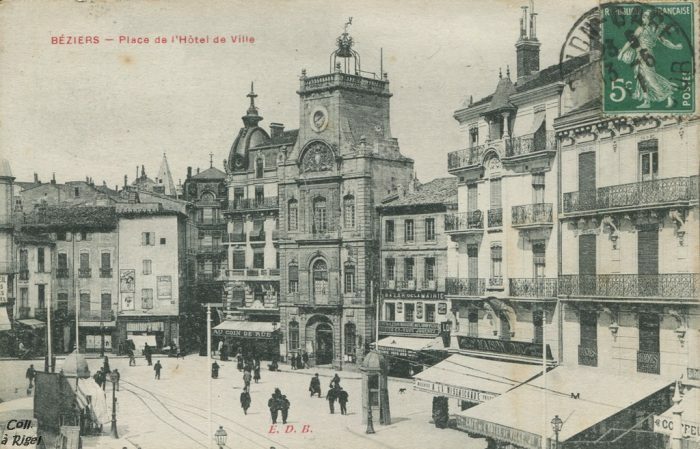 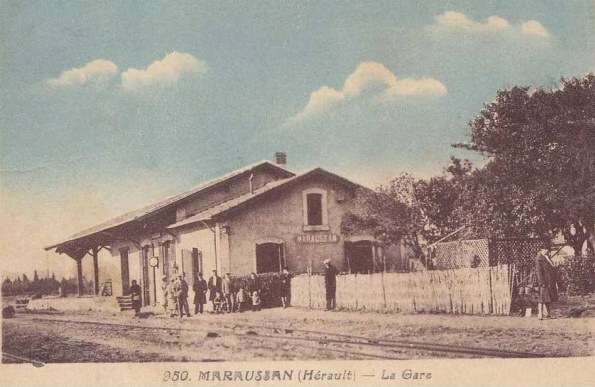 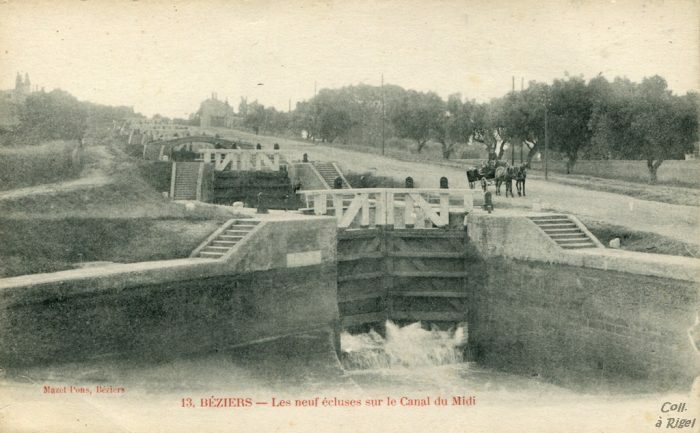 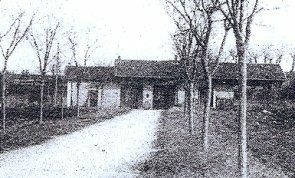 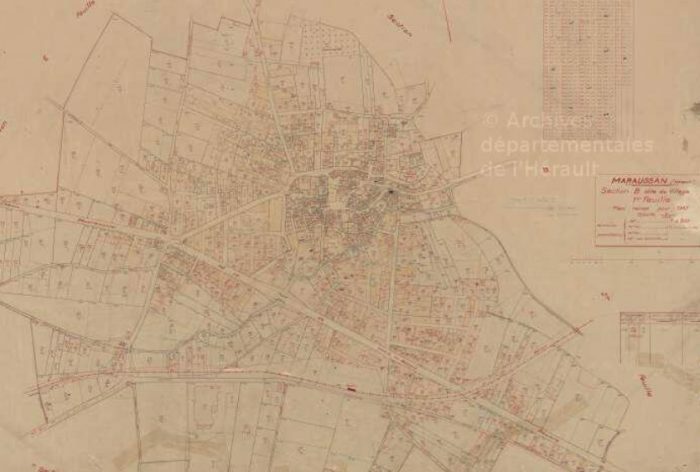 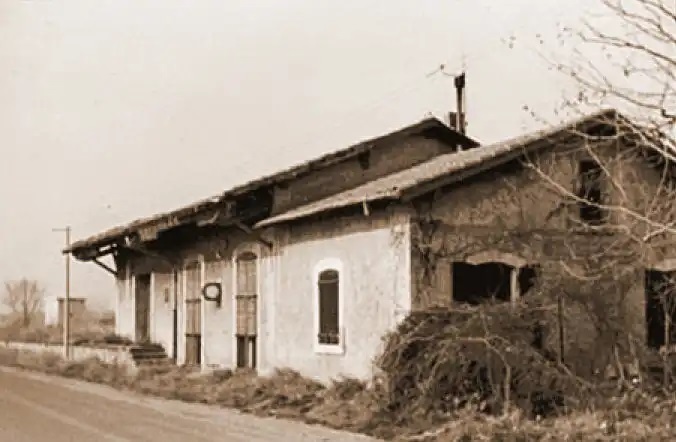 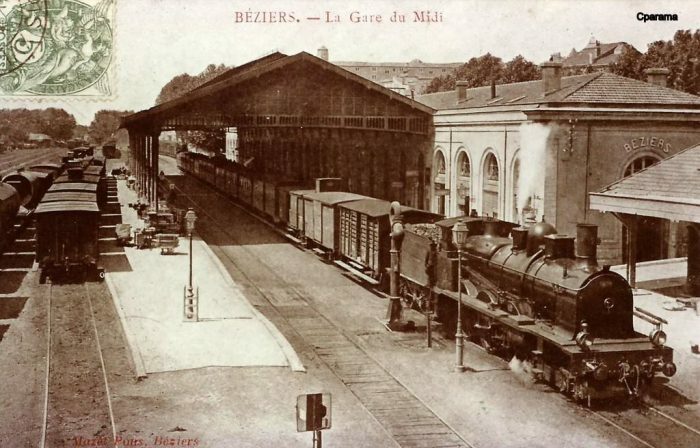 The station of Cazouls-lès-Béziers, was provided with 5 loops and one siding at that time. 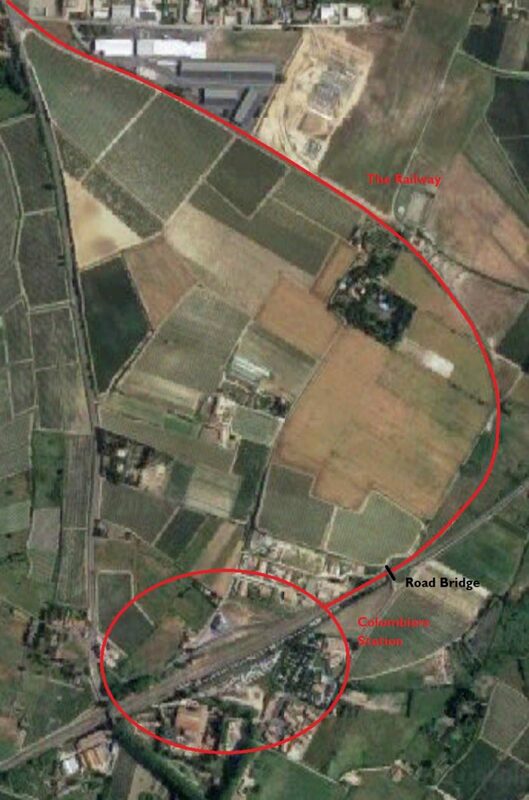 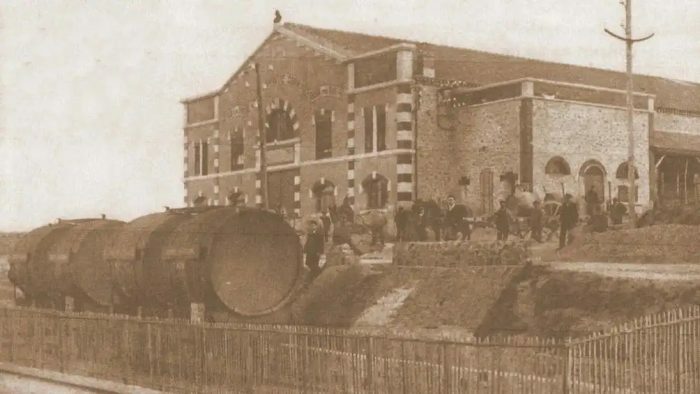 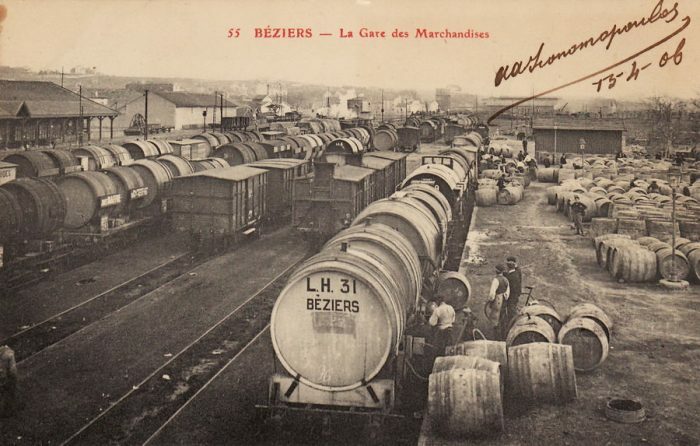 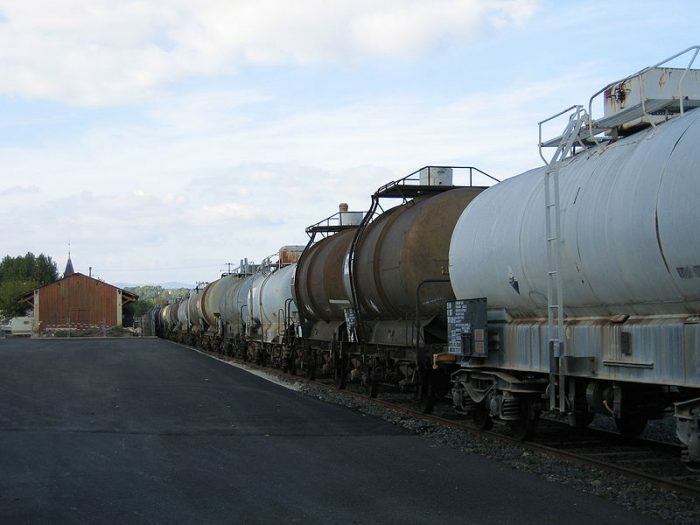 Since the end of 2015 the Owens-Illinois Manufacturing (formerly BSN Glasspack) glassworks in Béziers shipped bottles by full train twice a month from Maureilhan station, which has five loops and 4 sidings. 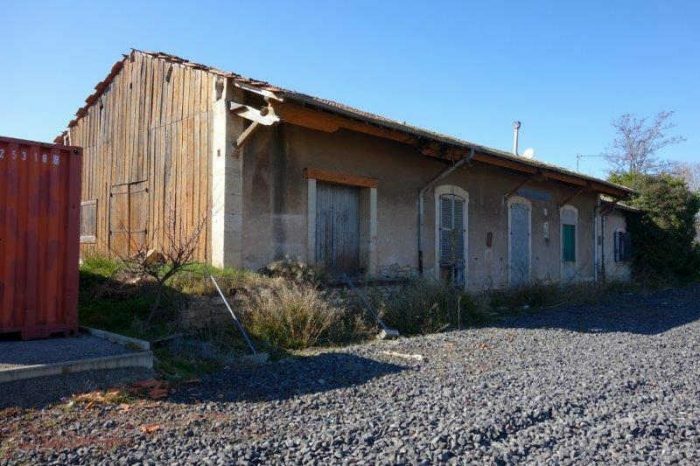 Another trackhad been planned to serve the industrial area of ​​Béziers West, where the glassworks is located. 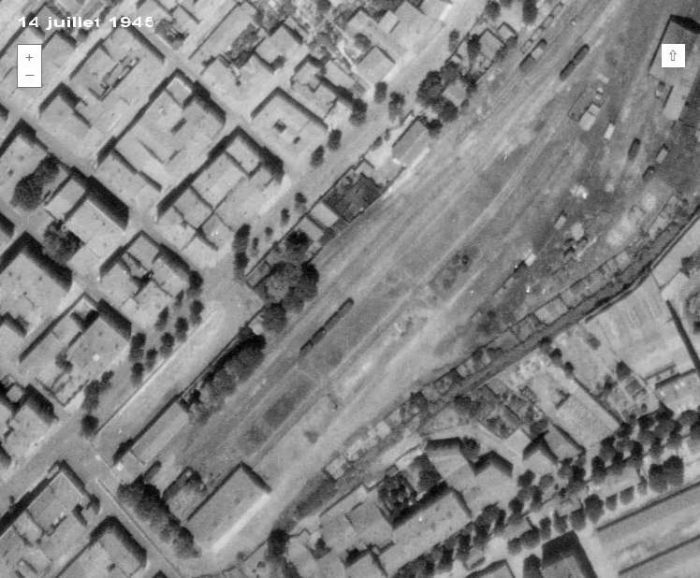 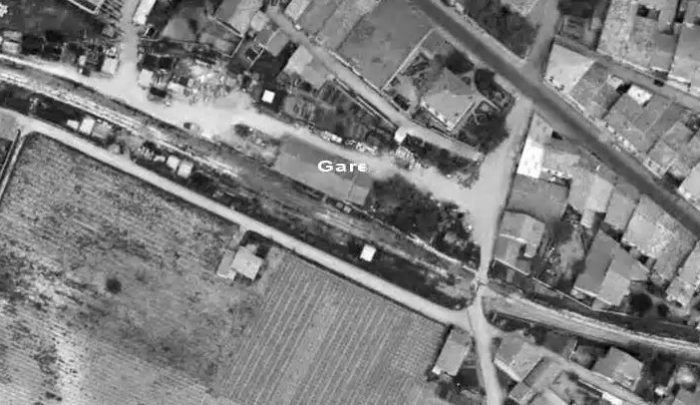 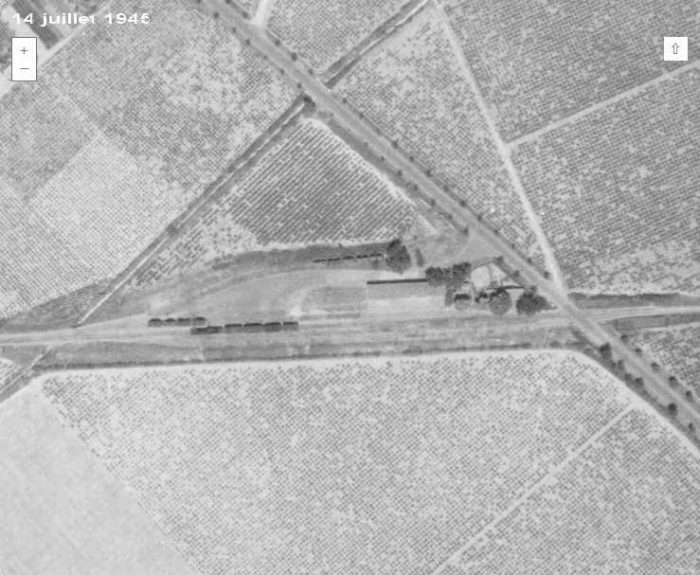 The station is shown from above in two adjacent aerial images. 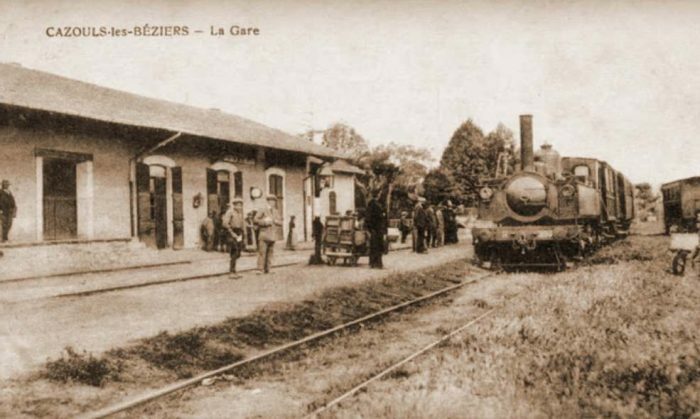 Both are taken from the IGN site ‘Remonter-les-Temps’. 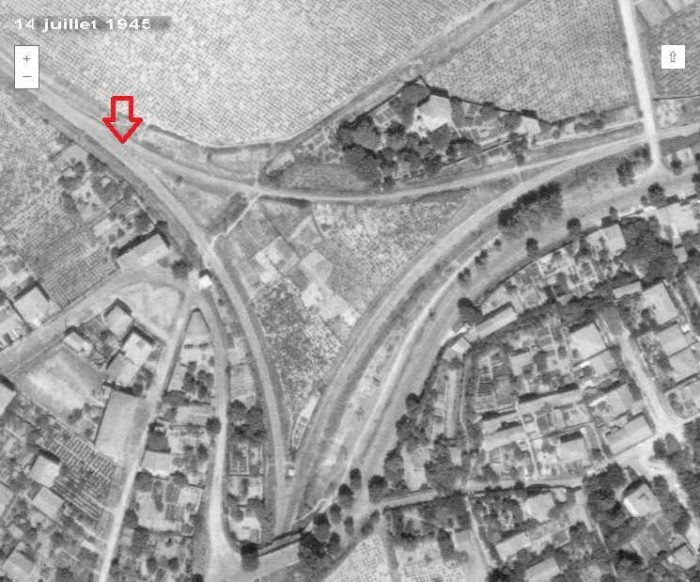 They show the station are in the early 1960s and again in 2015. 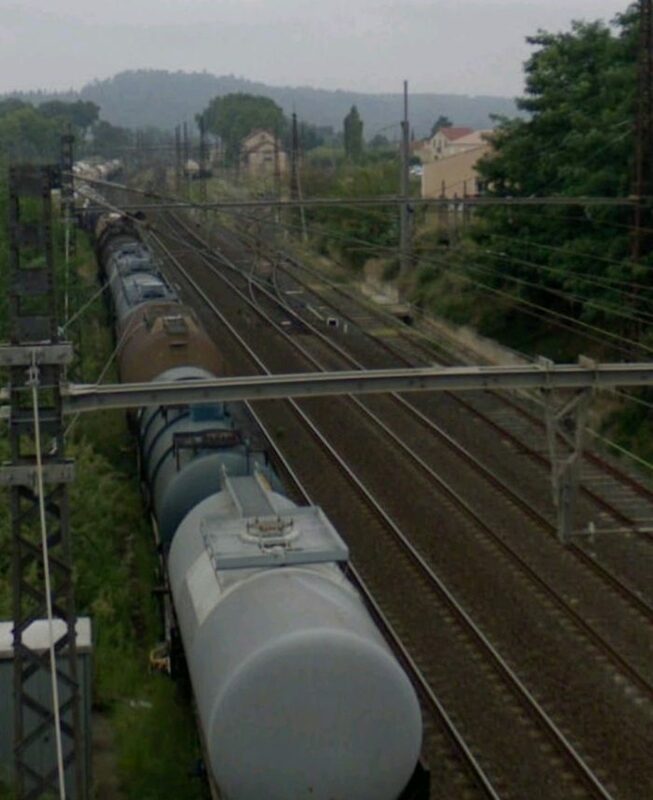 The next image, below, is taken from the Avenue Jean Jaures looking over the bridge parapet back into the station area in 2018. 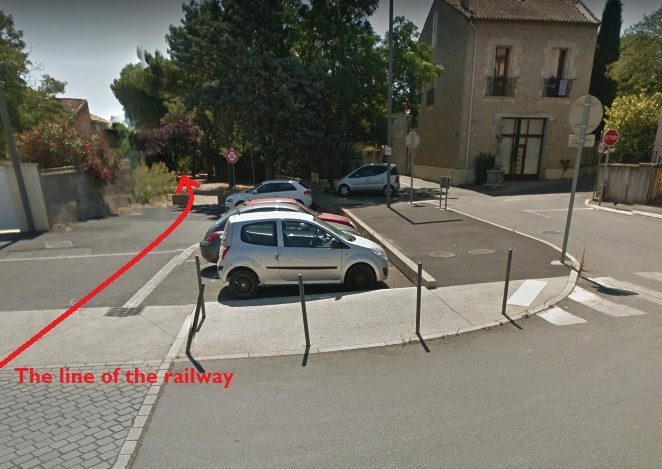 It has been sourced from Google Streetview. 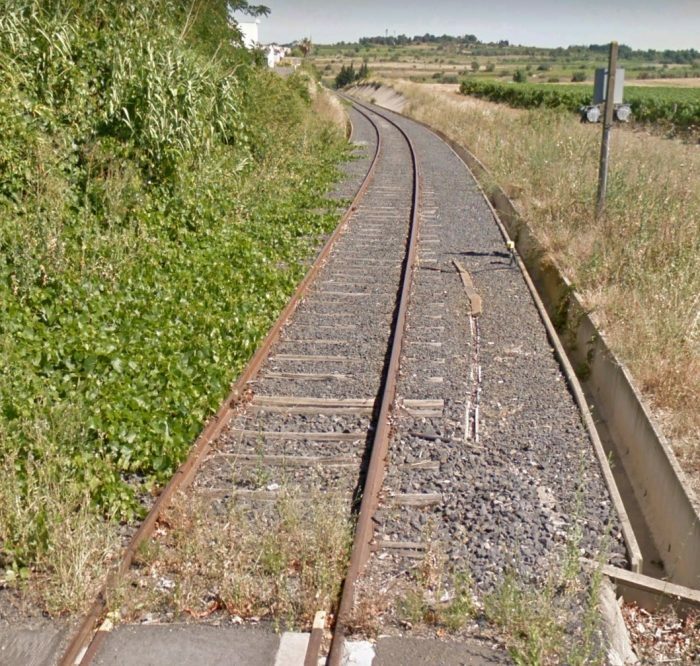 The railway ballast is still in evidence. 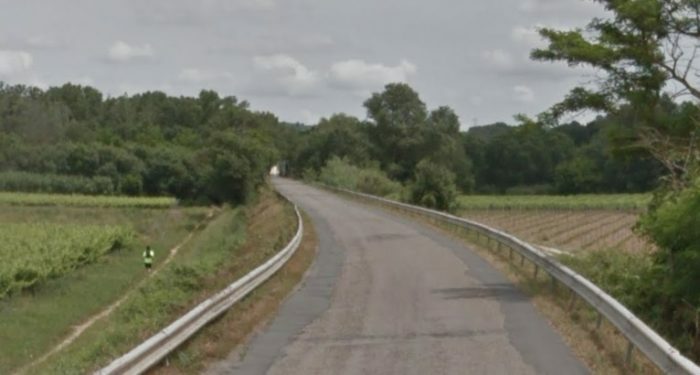 The new greenway runs on the left side of the cutting. 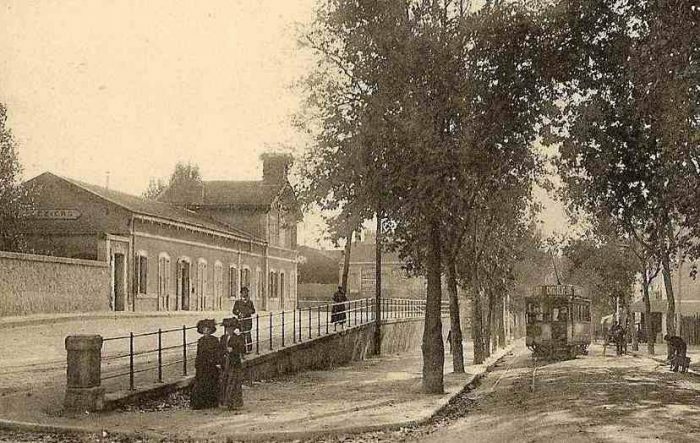 This Google Streetview image looks South from Avenue Jean Jaures and shows the new greenway following what was the route of the railway. 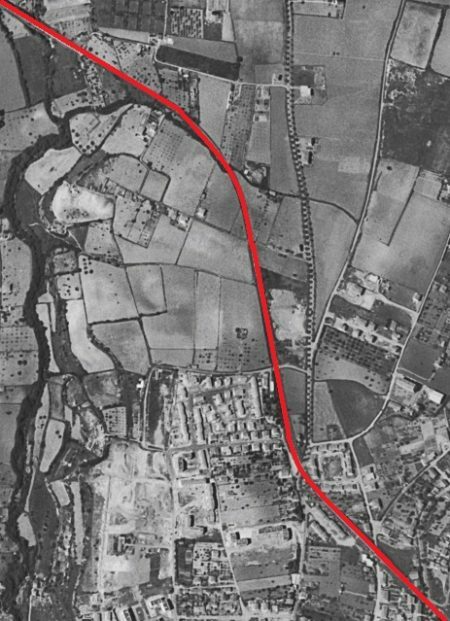 The 1950s land plan above has had the route of the railway added. 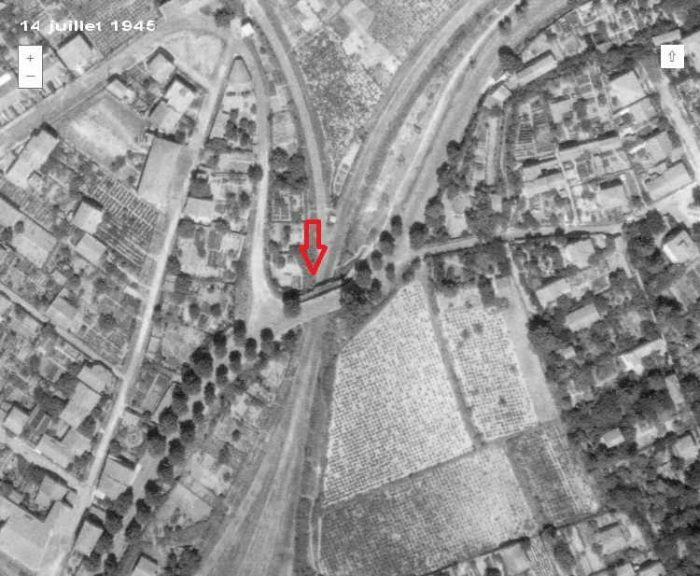 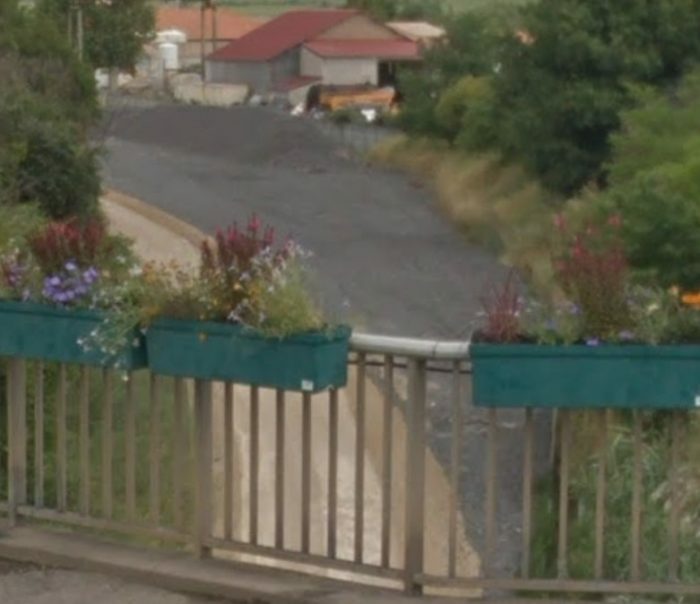 Immediately after leaving Maureilhan Station the line crosses the valley of Rau de la Guiraude on a curved viaduct which is shown from above in the next image, an aerial view from 2015. 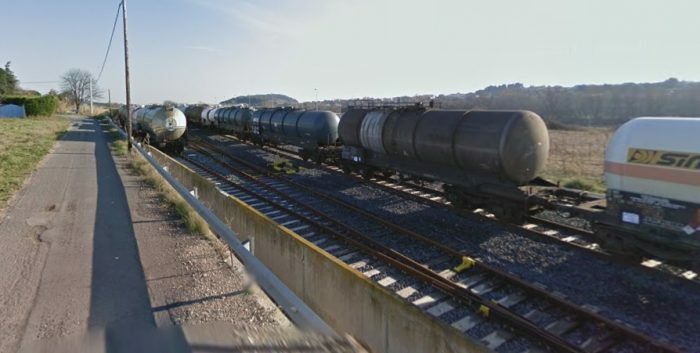 Beyond the viaduct the line followed a series of different lanes and roads, as can be seen in the Google Streetview pictures which follow. 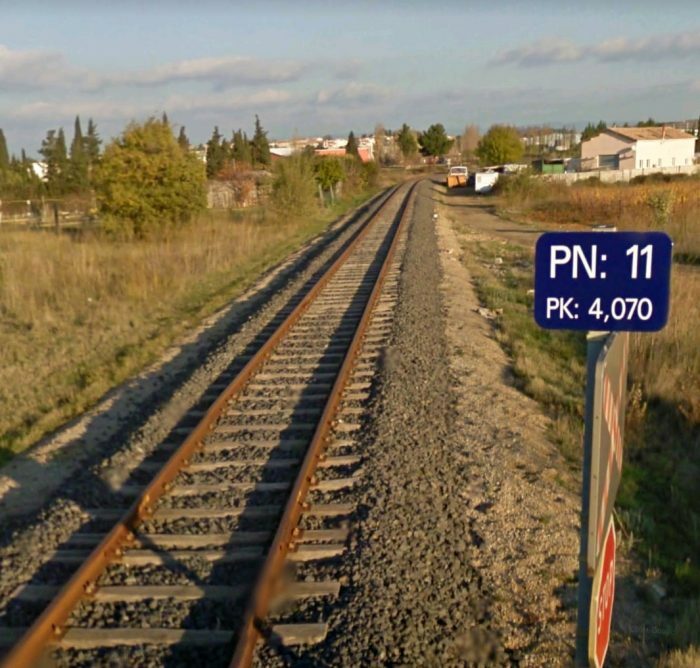 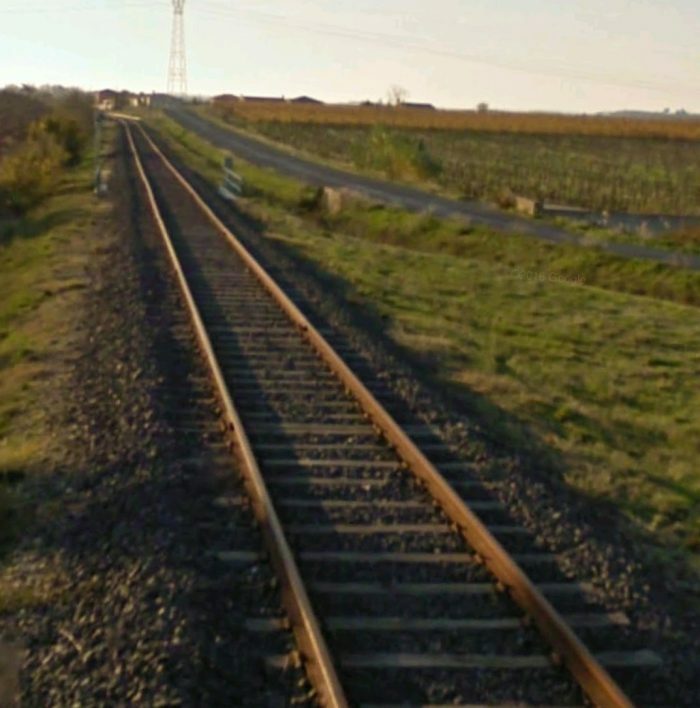 These next few photographs from Google Streetview illustrate the route of the line. 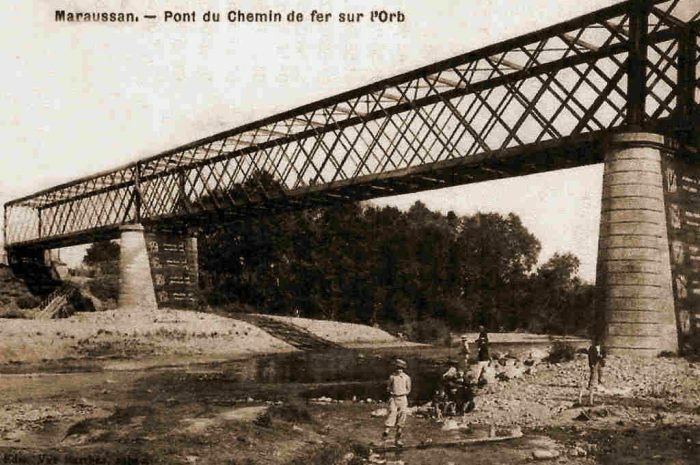 Looking back along the branch from the road bridge over the Midi Mainline. 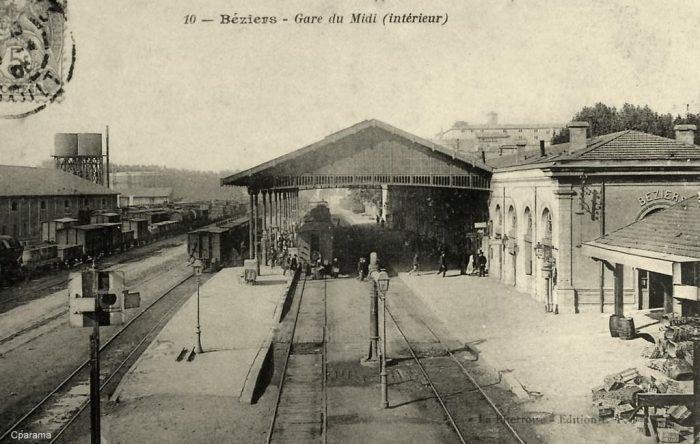 Colombiers station from the road bridge. 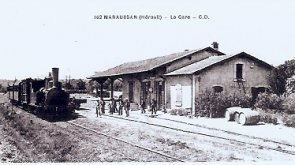 The station in 1963. 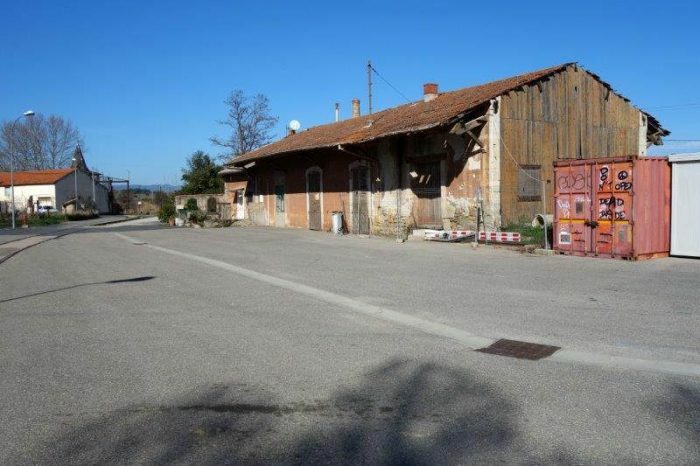 The station in 2015. 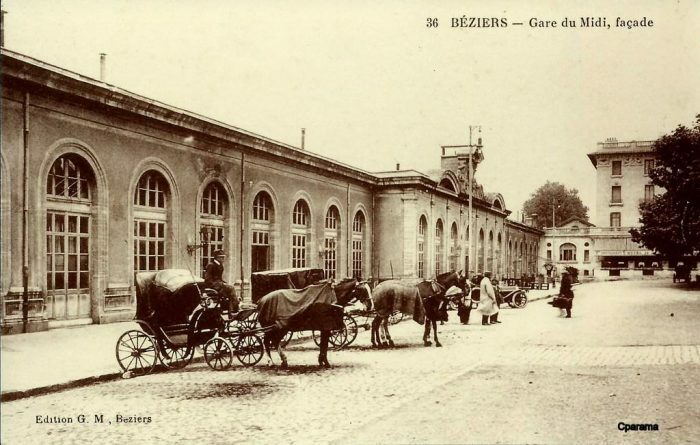 The two images immediately above show the Colombiers Station building. 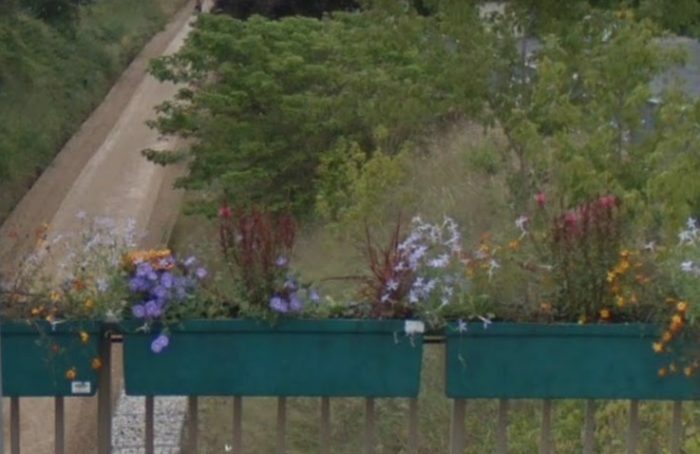 Both images are Google images. 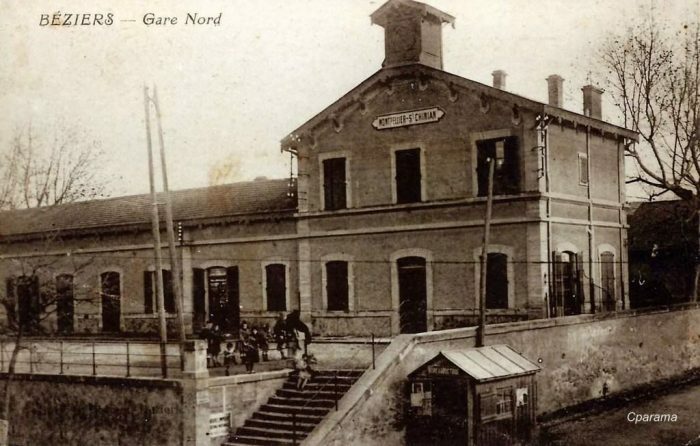 The Station Building looking East. 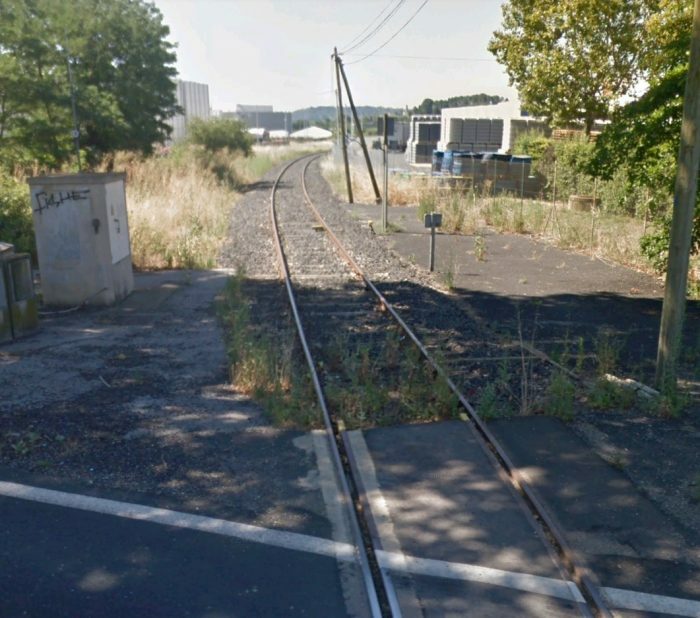 Looking back to the West through the station site in 2016. 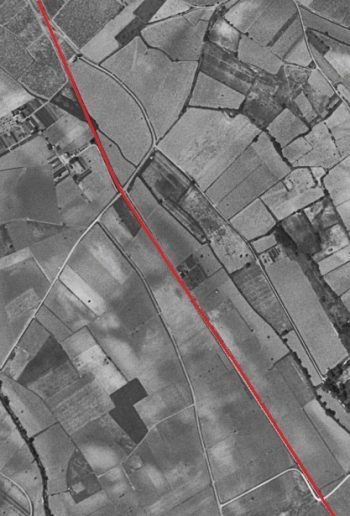 Looking along the route of the line to the East, from the same location. 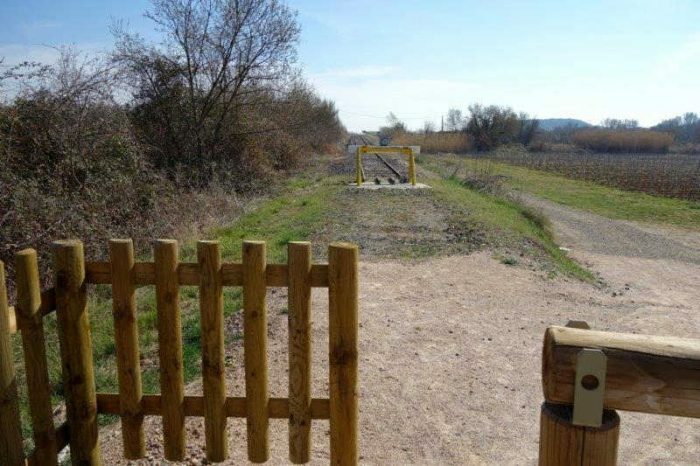 Looking back along the line of the old railway towards the last picture. 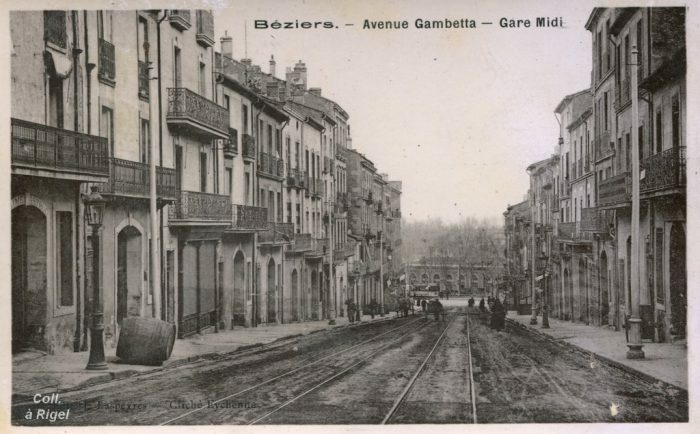 Looking ahead along the line towards Beziers. 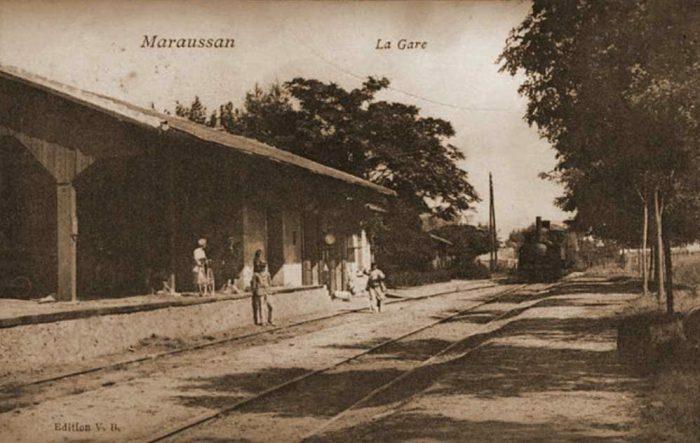 The line continued across open country from Maraussan along the line of what is now the D39. 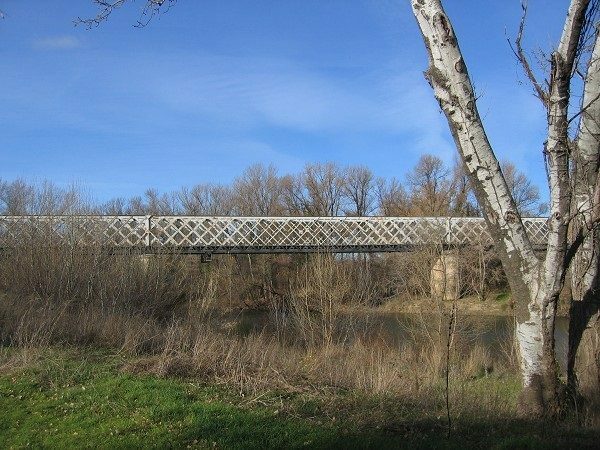 Among the trees above, it is just possible to pick out the end of the Truss Girder Bridge which spans the River Orb close to the next station for Lignan. 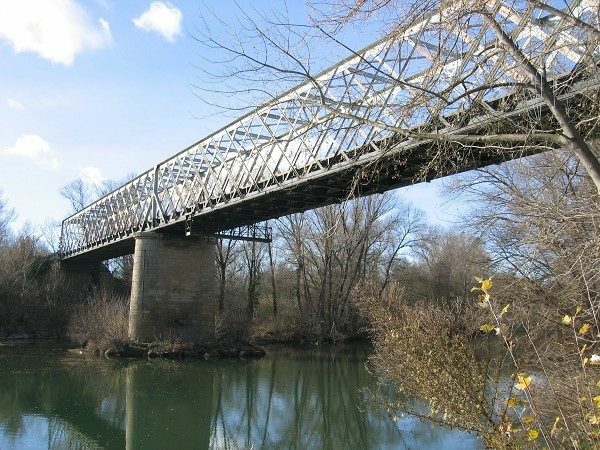 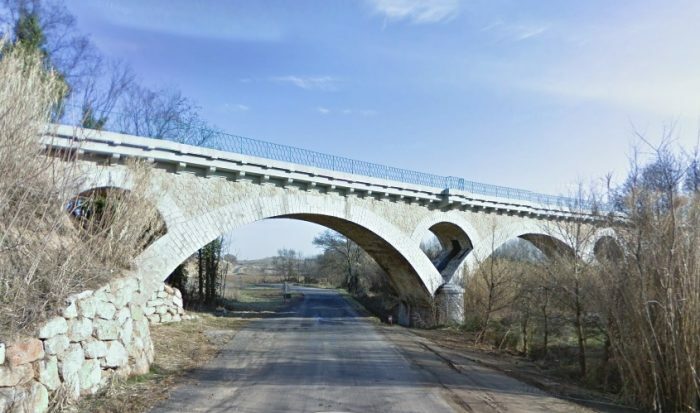 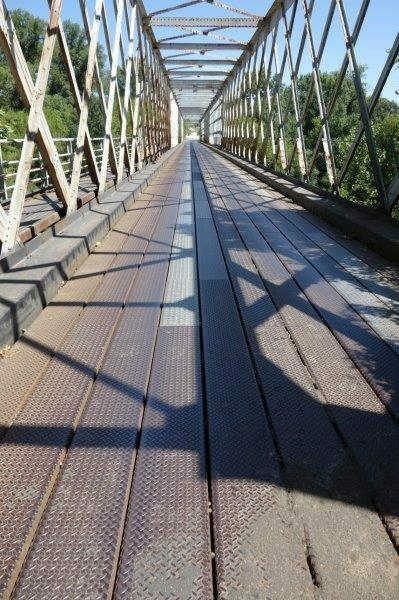 This is a significant simply supported truss structure which retains an early metal deck despite the fact that the bridge is used in the 21st century as a road bridge. 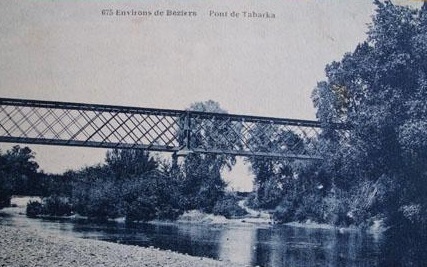 It is known as ‘Pont de Tabarka’. 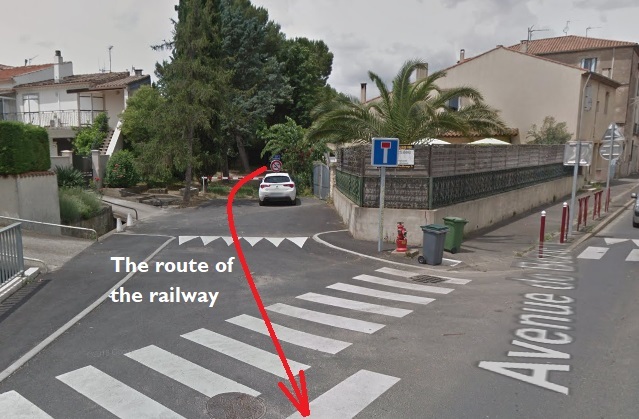 It caries a 30kph speed limit but there is no vehicle wight limit sign on the approach to the structure. 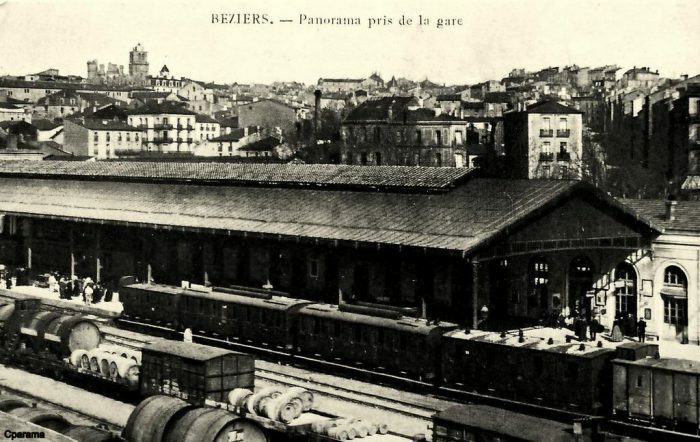 Beyond Lignan Station trains began a gradual loop around the north side of Beziers before entering the Railway Station. 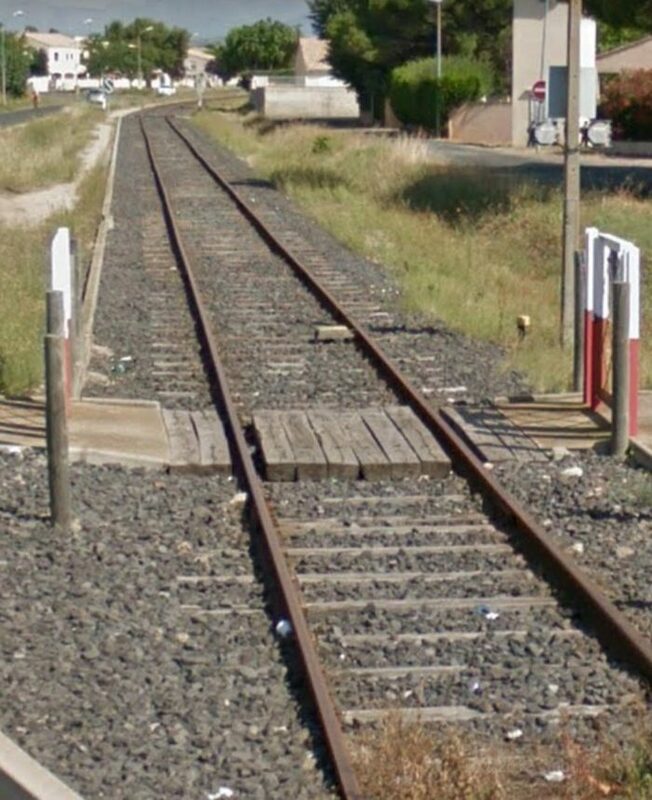 The present D612 (which is the northern ring-road for Beziers) sits over the old track-bed in the first instance. 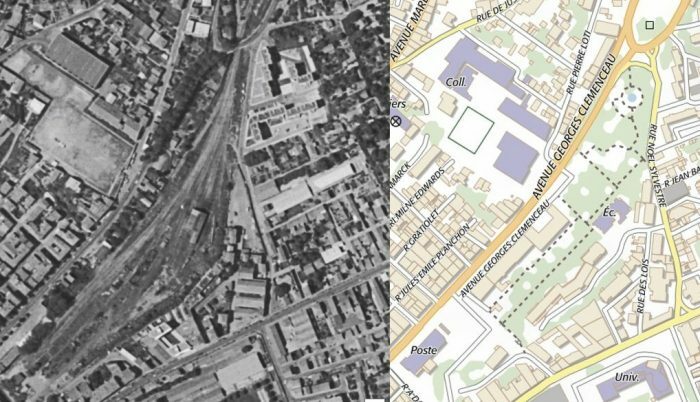 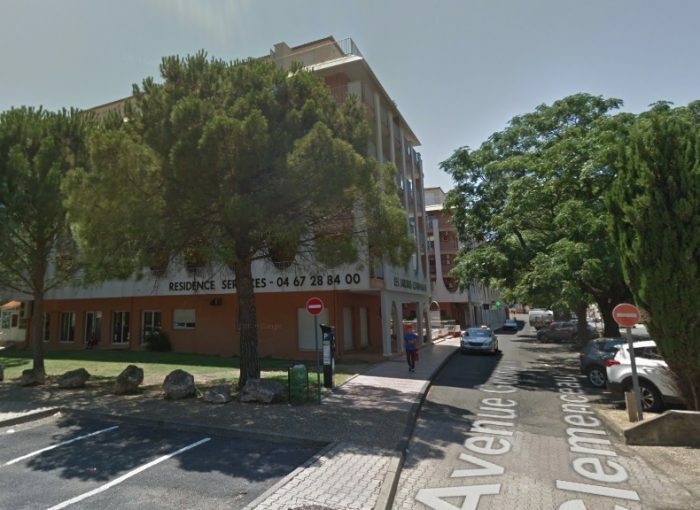 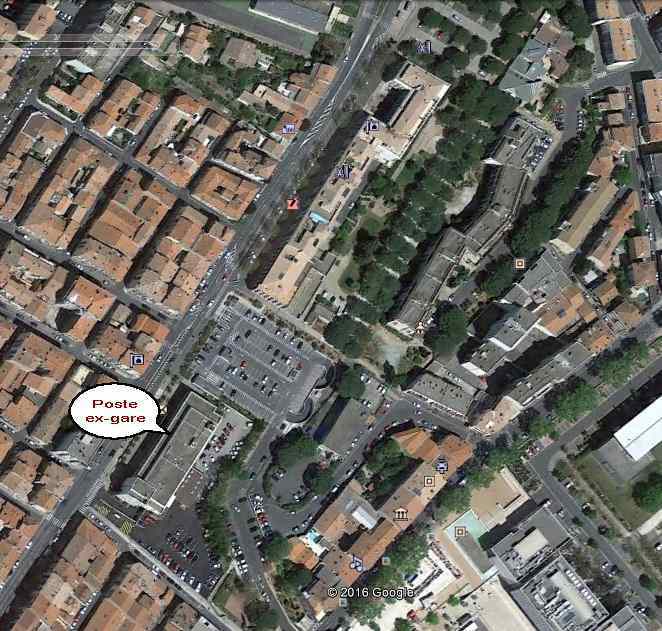 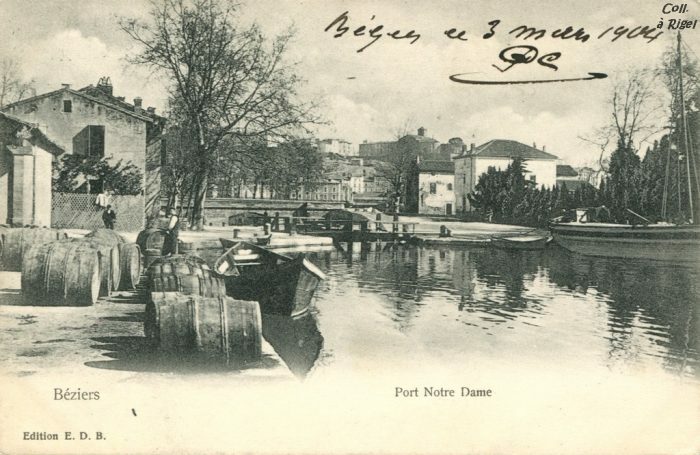 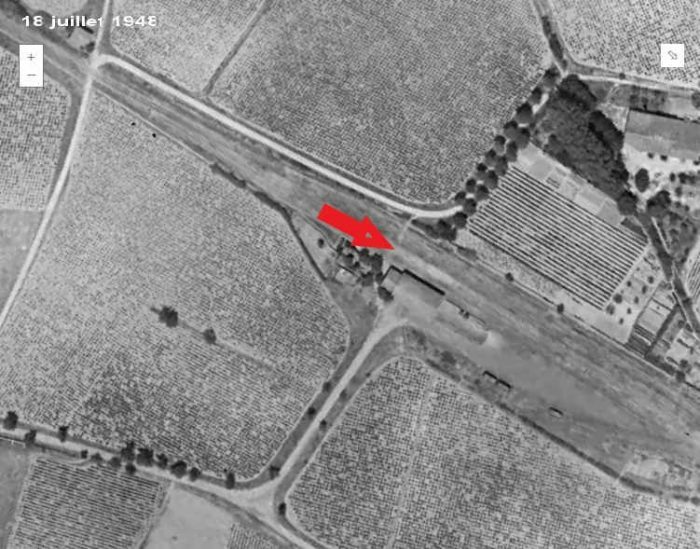 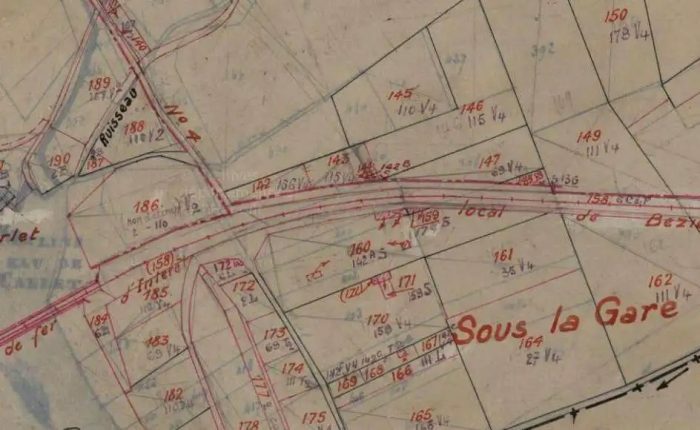 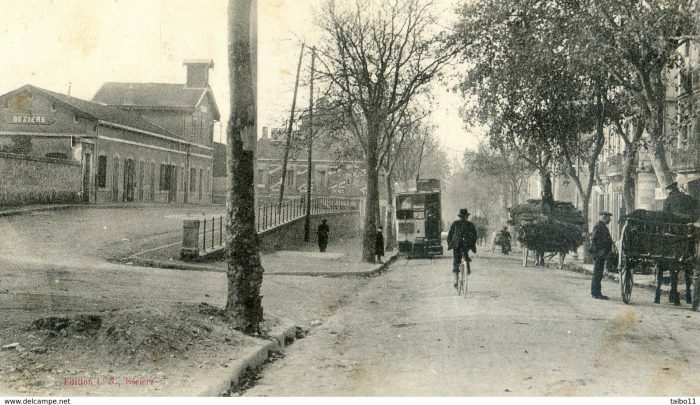 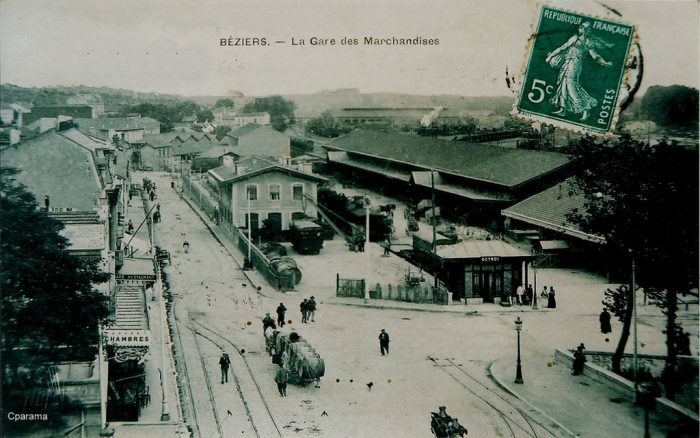 The old railway route then follows the modern Avenue Prefet Claude Erignac and then the Avenue Henri Pech into Beziers and what was the old station site. 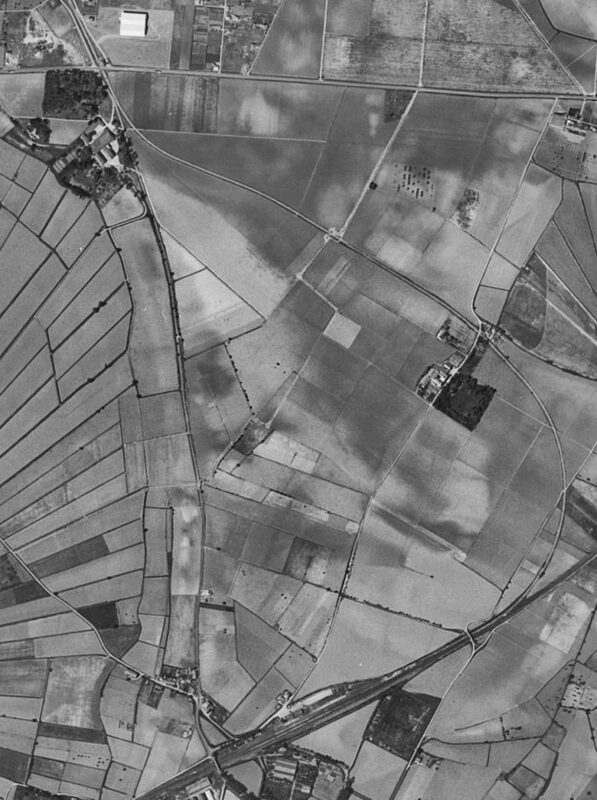 What was open fields in the early 1960s is now suburban development. 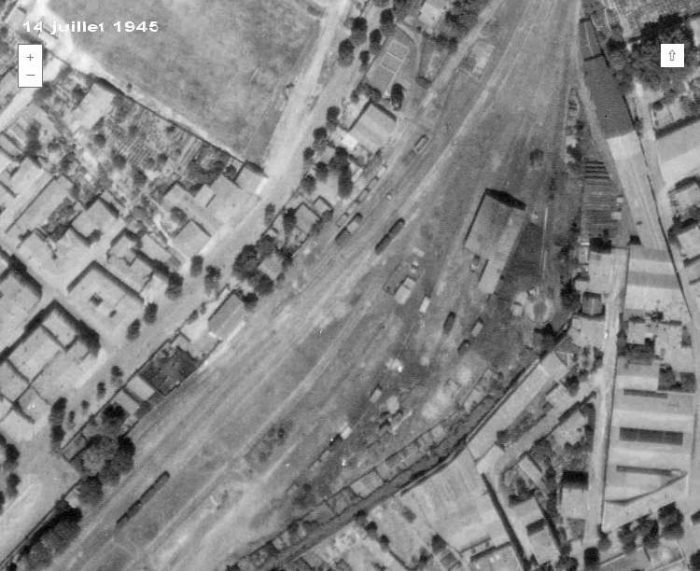 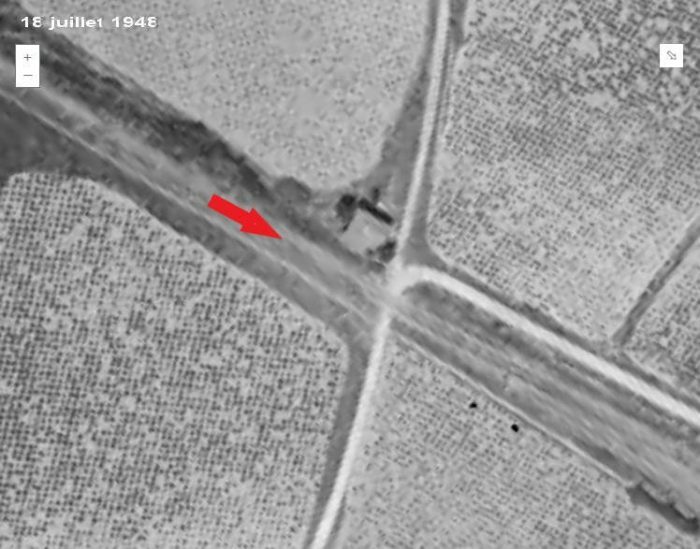 The tree-lined road on the adjacent aerial image is the Ancienne Route de Bedarieux. 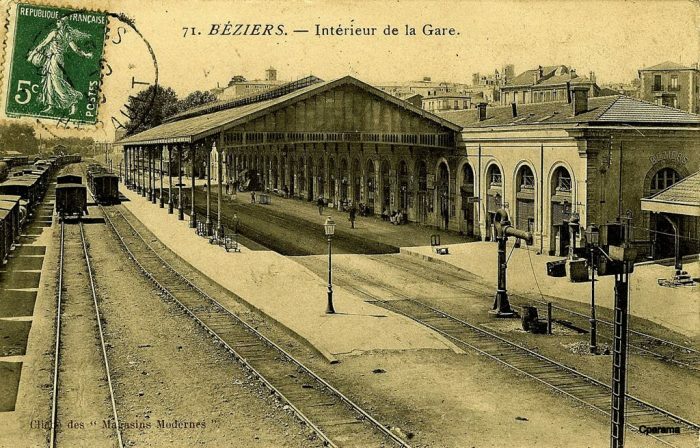 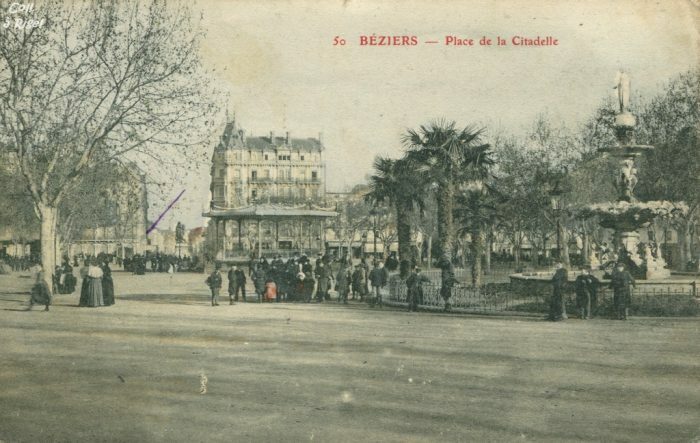 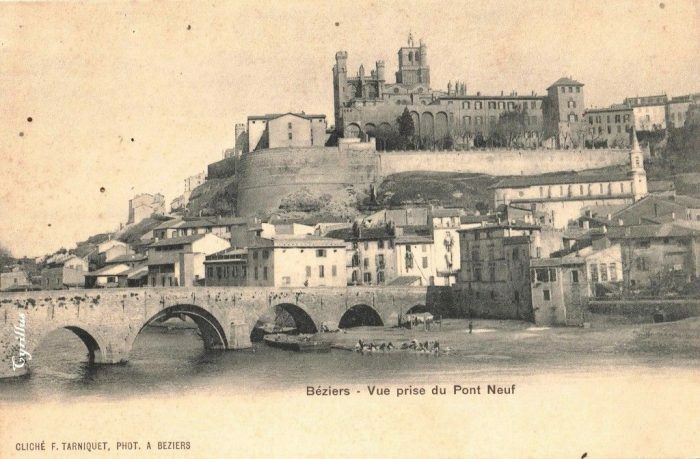 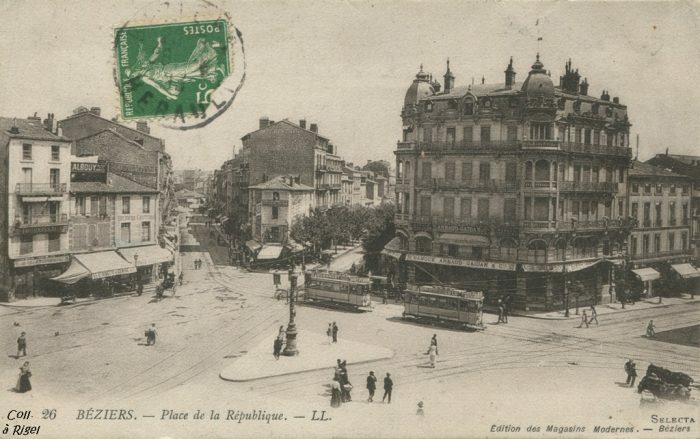 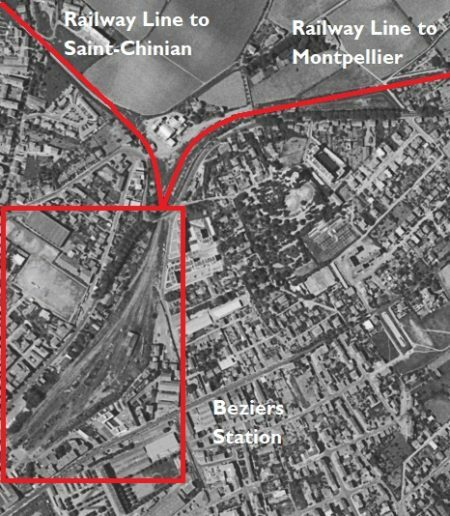 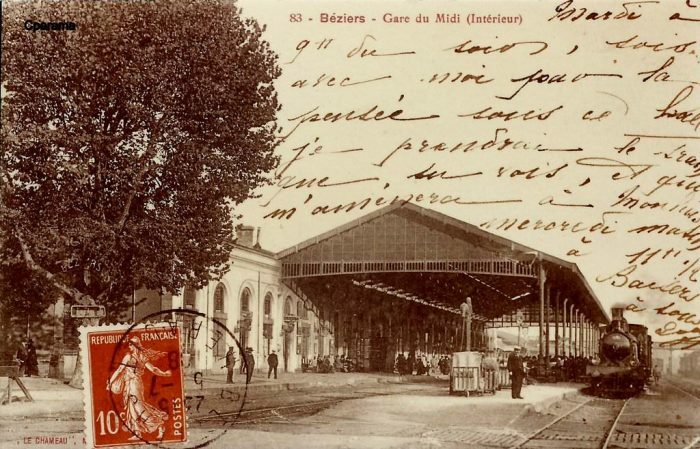 The station in Beziers was on the North side of the city in between what is now the Avenue Georges Clemenceau and the Avenue Jean Moulin. 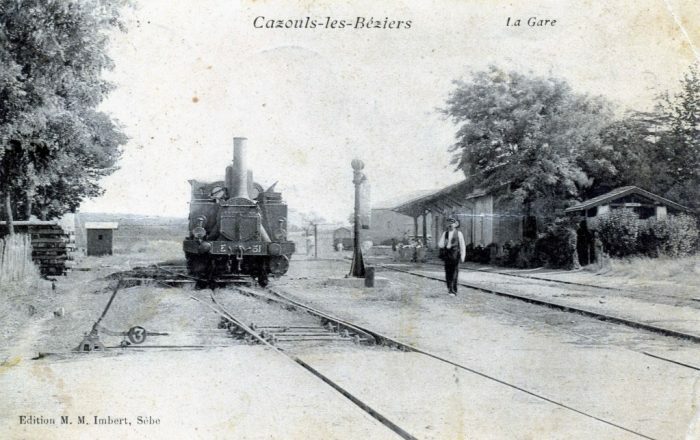 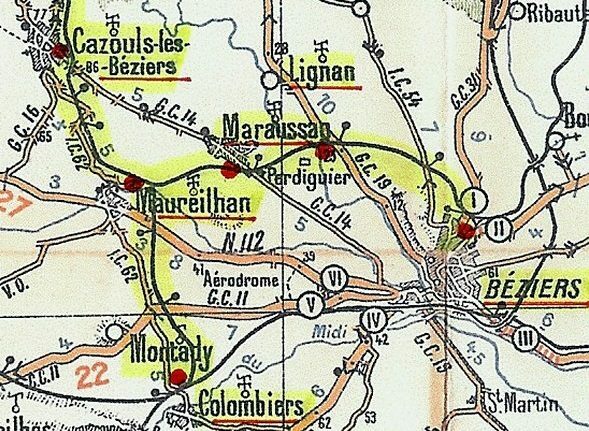 Two lines approached the station – the route we have been following from Saint-Chinian and a completely separate route from the East which ultimately provided a connection to Montpellier. 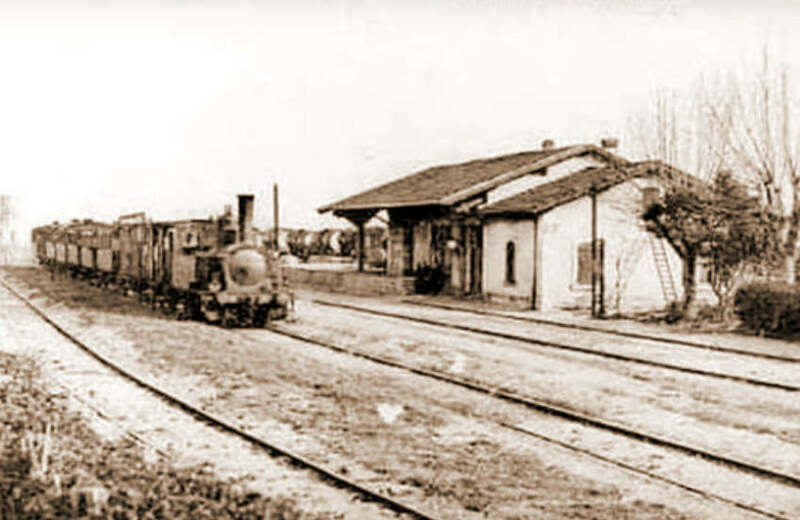 The status of the railway station was clearly that associated with a secondary line. 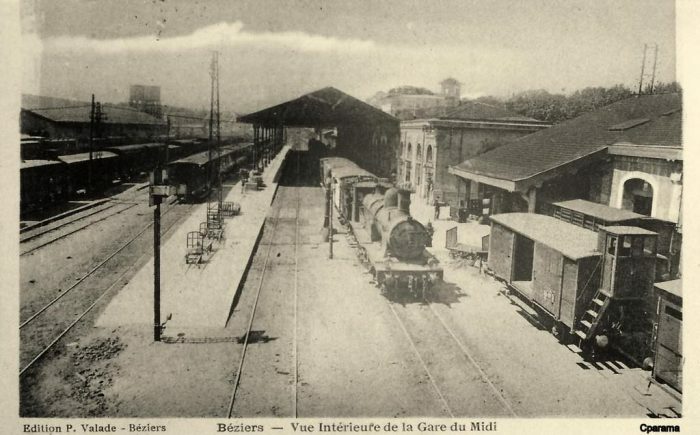 It becomes even more evident if the station buildings are compared with those of the Gare du Midi, the city’s primary mainline station. 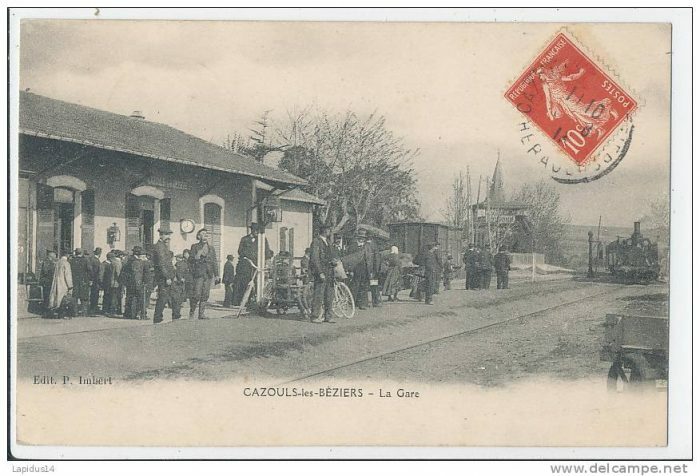 http://passes-montagnes.fr/htlm1/vf_saint-chinian_beziers-06.html, accessed on 18th March 2019.
http://www.trainsdumidi.com/t9376-pk-0948-gare-de-cazouls-les-beziers-34, accessed on 18th March 2019.
http://www.cazoulslesbeziers.com/12-culture-et-tourisme, accessed on 18th March 2019.
https://fr.wikipedia.org/wiki/Fichier:Chemins_de_fer_de_l%27H%C3%A9rault_-_Gare_de_Cazouls_c%C3%B4t%C3%A9_voies.jpg, accessed on 18th March 2019.
http://passes-montagnes.fr/htlm1/vf_saint-chinian_beziers-06.html, accessed on 17th March 2019.
https://www.railpassion.fr/infrastructure/fin-chemins-de-fer-de-lherault, accessed on 18th March 2019.
https://remonterletemps.ign.fr, accessed on 18th March 2019.
http://archives-pierresvives.herault.fr/ark:/37279/vta55925bc2c5469/dao/0#id:1958869877?gallery=true&brightness=100.00&contrast=100.00&center=6153.856,-4714.822&zoom=6&rotation=4.712, accessed on 18th March 2019.
http://cahiers.de.minerve.pagesperso-orange.fr/HTML/cdf_bezierssaintchinian.html, accessed on 18th March 2019.
https://remonterletemps.ign.fr, accessed on 19th March 2019.
https://commons.m.wikimedia.org/wiki/File:Chemins_de_fer_de_l%27Hérault_-_Maureilhan_et_viaduc.jpg, accessed on 19th March 2019.
http://archives-pierresvives.herault.fr/ark:/37279/vta558b79102845f/dao/0#id:665356471?gallery=true&brightness=100.00&contrast=100.00&center=6460.000,-4488.000&zoom=6&rotation=0.000, accessed on 20th March 2019.
http://passes-montagnes.fr/htlm1/vf_saint-chinian_beziers-07.html, accessed on 20th March 2019.
http://adicab.over-blog.com/article-45469237.html, accessed on 20th March 2019.
https://www.cparama.com/forum/maraussan-t29903.html, accessed on 20th March 2019.
http://cahiers.de.minerve.pagesperso-orange.fr/HTML/cdf_bezierssaintchinian.html, accessed on 20th March 2019.
http://passes-montagnes.fr/htlm1/vf_saint-chinian_beziers-08.html, accessed on 20th March 2019.
http://www.todocoleccion.net, accessed on 20th March 2019.
http://www.centerblog.net/journal-intime/15183-6572077-le-pont-de-tabarka-, accessed on 20th March 2019.
https://commons.wikimedia.org/wiki/File:Chemins_de_fer_de_l%27H%C3%A9rault_-_Maraussan_pont_de_Tabarka.jpg, accessed on 20th March 2019.
http://fracademic.com/dic.nsf/frwiki/1355689, accessed on 20th March 2019.
https://www.cparama.com/forum/beziers-t304.html, accessed on 20th March 2019.
https://www.delcampe.net/fr/collections/cartes-postales/france/beziers/34-beziers-gare-du-nord-et-avenue-de-pezenas-charrettes-tram-704159491.html, accessed on 20th March 2019. 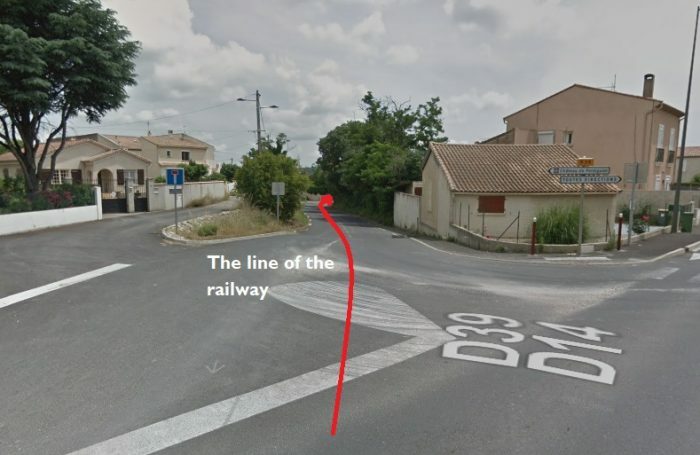 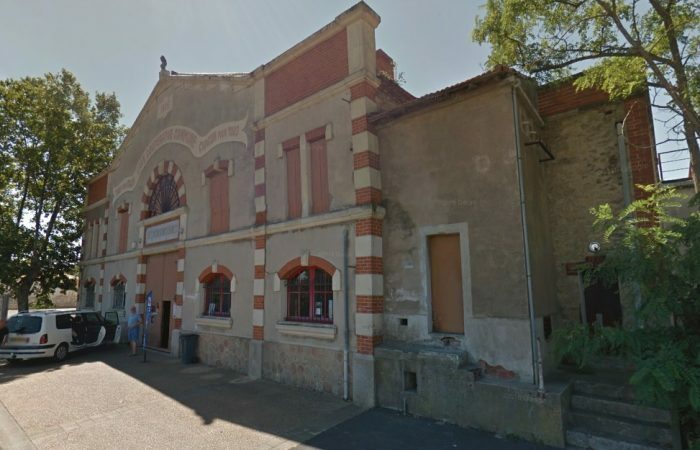 This entry was posted in Railways and Tramways of South-Western France, Railways Blog on March 20, 2019 by rogerfarnworth.